The Hublet and I were clicking through a continuous stream of generic crappy television the other night while waiting for our movie to start, and we happened to pause on an advertisement that was already a few seconds into play. Some elaborate font scrolled into life with the words, ‘Love is Universal…‘ which then moved to a scene of a man gently guiding a woman through a doorway, one hand over her eyes, a smile of expectant anticipation on her face. The scene faded out as he took his hand away while murmering, “Open your eyes.” We cut to more of the elaborate font with the words, ‘How it’s expressed is not‘. 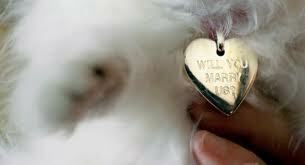 The advert then moves to a shot of a bug-eyed white fluffy kitten, then cuts to a close-up of its collar from which hangs a gold heart inscribed with words, ‘Will you marry us?‘ The woman turns from the fish faced furball with a look of joy on her face and they move in to kiss, the cat held in her arms the whole time. 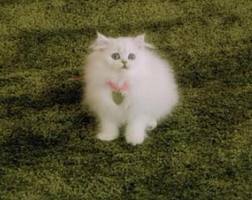 I have no idea how the rest of the advert concluded as almost as soon as we saw the little bulging-eyed hairball with the ‘Marry Us’ collar, The Hublet squeaked in a falsetto, “No,” and did the amazingly accurate sound effect of a cat flying through the air at great speed. I laughed until I cried and then I laughed some more until my tears had all been used up. “The best ingredient is love…” Oh dear, combine that with the little wall eyed powder puff and I think I may need a bucket. Previous Post Oh where oh where has Shahid Khan’s yacht gone? Oh where oh where can it be?